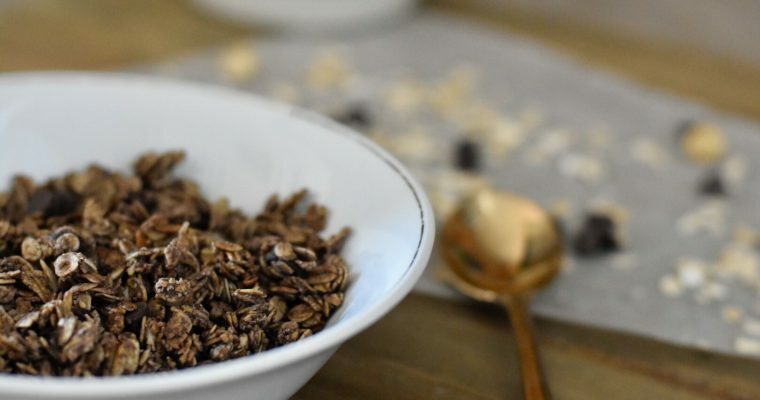 Once you will make your own granola then you will come to know that how easy is to make granola at home, which won’t contains any preservatives, extra sugar and additives. Simple and natural which is very easy to make, chipper and fresher than the store bought one and not at all time consuming if you have oven. 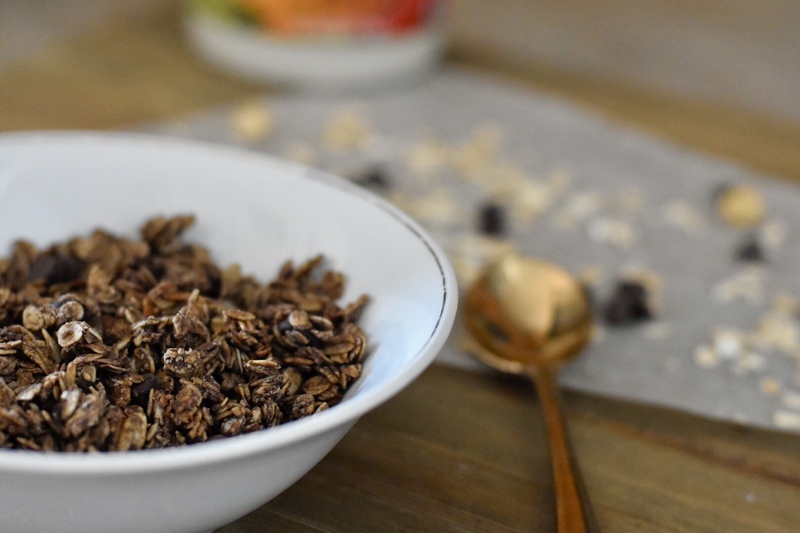 Chocolate granola is great as a breakfast or to munch on which makes great and healthy breakfast or snacks for the one who are running out of time. 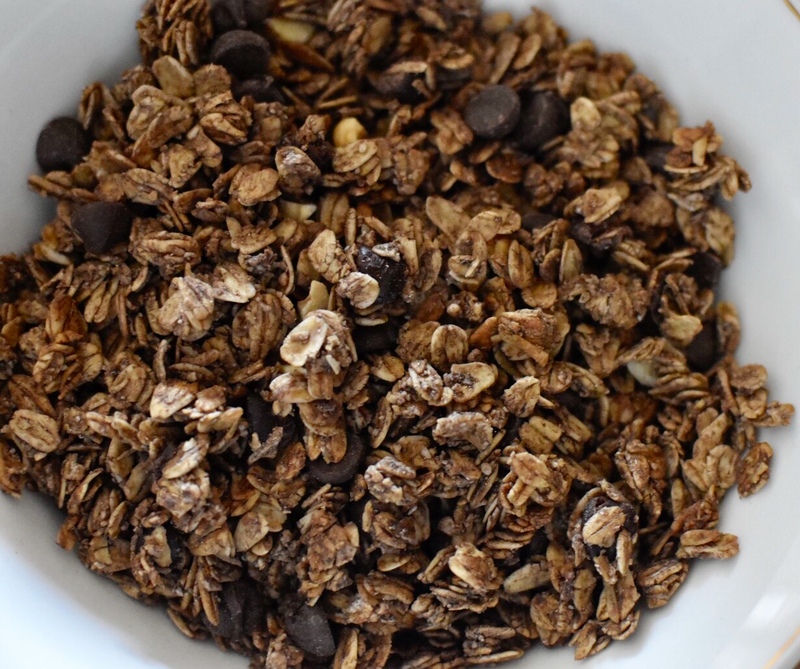 Chocolate granola is crunchy, having chocolate flavor, lightly sweeten with maple syrup and with more chocolaty flavor with those little chocolate chips. I have added coarse powder of hazelnut to the granola, which is enhancing the nutritional value of the dish as well as giving nice clusters. Make it anytime and store it in airtight container once it is cool down completely. You can add chocolate granola in the milk and have filling healthy breakfast or top it on the yogurt with seasonal fruits chunks it will taste awesome. 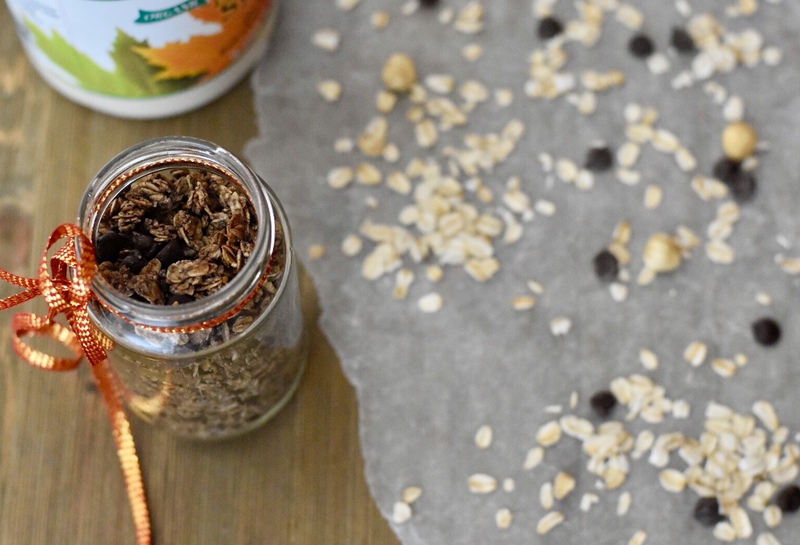 Once you will make granola at home then you won’t buy it from the grocery store that is my guarantee. 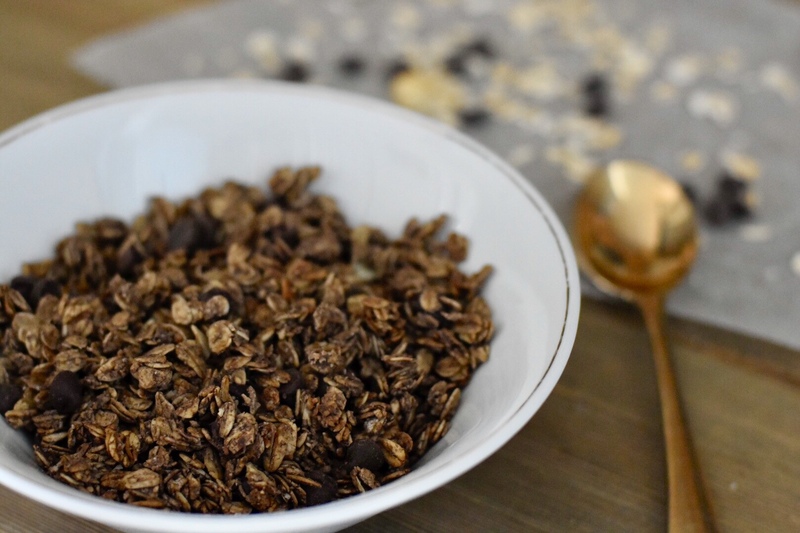 Super easy and affordable way to eat oats which is chocolate flavored and light crunchy. Take one big bowl. Add all the dry ingredients except cocoa powder. 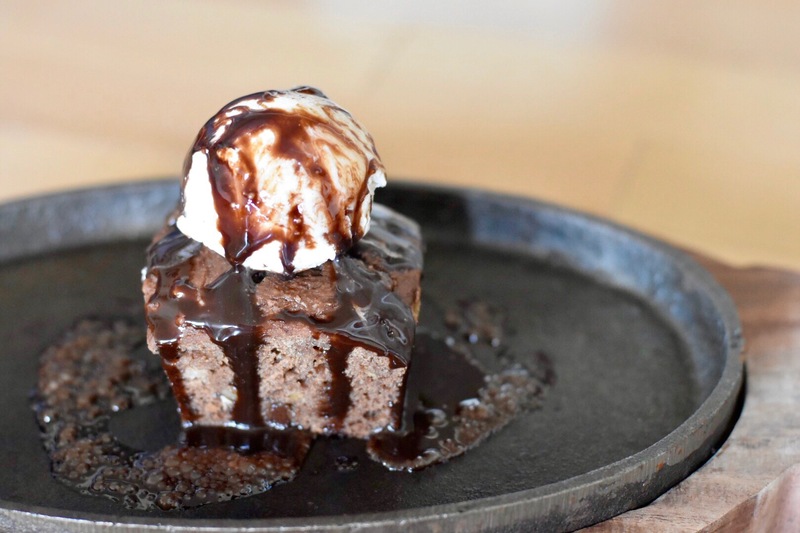 Take microwave safe bowl add maple syrup, coconut oil and cocoa powder. Heat it up in the microwave for 20 sec. Mix it all well after adding vanilla extract to the mixture. Add wet mixture to the dry mixture of oats and nuts. Mix it thoroughly and add it to the oil coated baking tray. Bake it into 350* F preheated oven for approximately 20 mins or till it will turn light brown. Let it cool down completely once it is baked. Eat it as a snack or with the milk or with the yogurt with some fruits. If you don't have maple syrup then replace it with honey, agave or sugar syrup. You can play with the flavors of your choice. You can add flax seed, chia seed, pumpkin seed or cranberry or some dried fruits and nuts too. Look for the gluten free oats if you are having allergy with gluten. 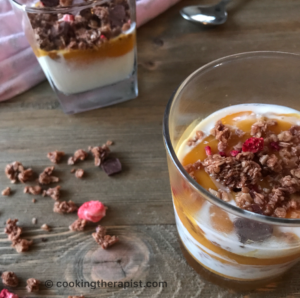 Check my Mango Granola Parfait to make delicious healthy dessert or breakfast. Pure Canadian maple syrup which is sourced from the maple tree not only tastes better than processed sweeteners made from corn syrup, it is also better for you. Based on research by the Canadian Nutrient File (Health Canada), maple syrup’s nutritional value is superior to other common sweeteners, such as honey, sugar, and even brown sugar. The calories in maple syrup are lower than in corn syrup and honey, averaging about 50 calories per tablespoon. Pure Canadian maple syrup also contains 18% of the recommended Daily Value of zinc, which is essential for a healthy immune system. And the health benefits of Oats you all know now and if not then check here. What do you waiting for make it for you and your family and follow us on Facebook for latest updates.